Hi dear reader! 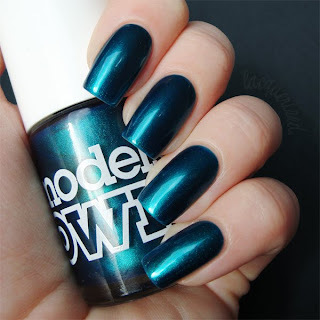 Today I'm showing you something I'm really excited about: Peacock Green by Models Own. Trust me when I say these pictures don't do any justice to the color, depth and overall beauty of it! This is what it looks like when green meets blue, and they click ;-). It's super glowy and it almost looks like a duochrome. I stole this one from my mom's helmer, and I can't believe I didn't order this one myself. The formula is nice, it's a 3 coater though, but application was really smooth. I also found out Models Own is hosting a contest where you can win 12 of their most wanted colors. And if you don't win you'll get a 30% discount on your next order :-). You only have to fill out a survey. Sounds pretty nice huh? So if you're into this brand please check it out. This contest ends the 29th of March, so you'll have 1 day left! So we're at the end of this post again, thanks for stopping by and enjoy your sunday!